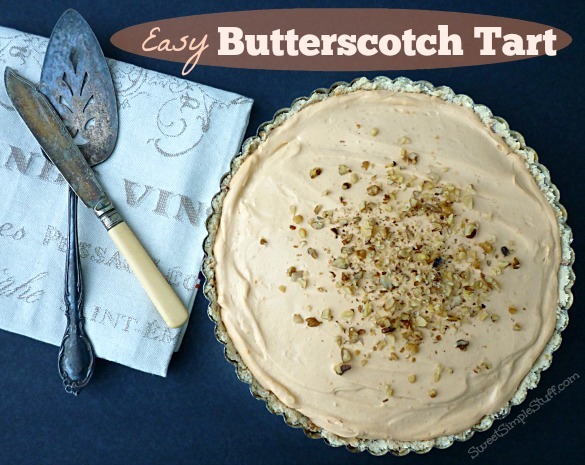 This easy peasy recipe usually gets made and left in a square cake pan … not today … looks so much fancier in a tart pan and served on a cake plate! 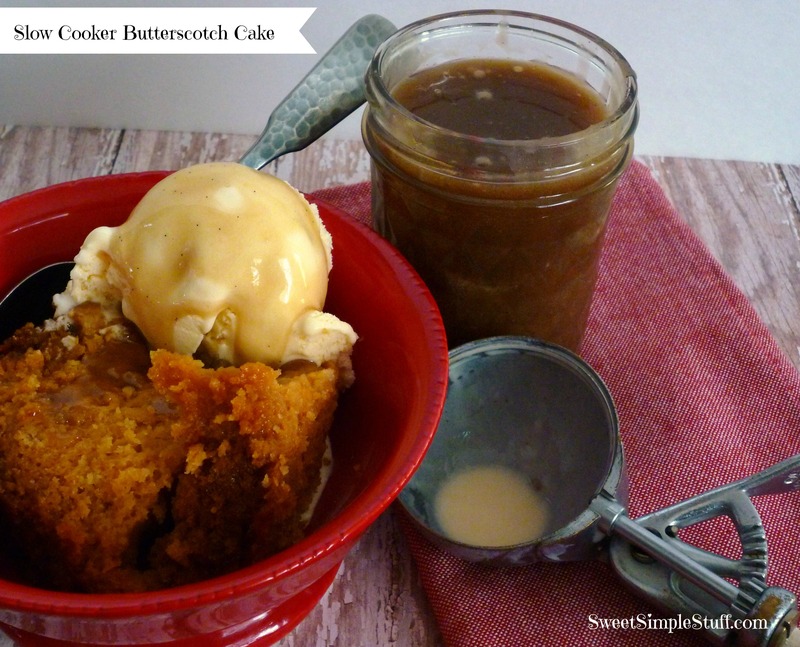 What ever shape you decide to make this dessert … you will be happy with the results! I haven’t finished cleaning, but I made dessert! We all have different priorities … cleaning or dessert, which should come first? 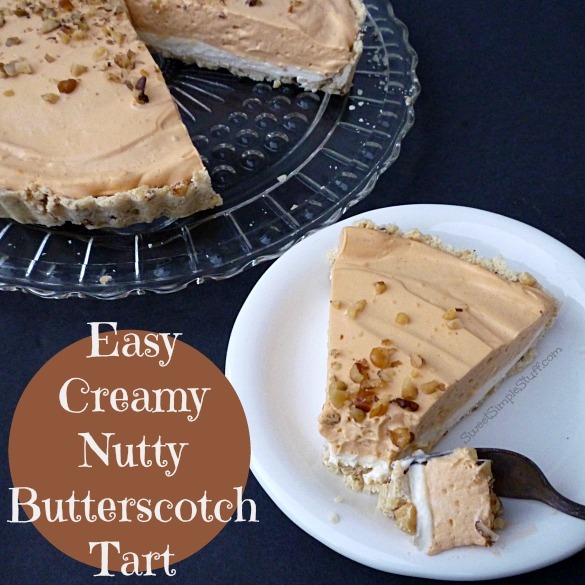 Keep in mind that this tart is simple to make, has a nutty cookie like crust, is cool and creamy and butterscotch! Now answer the question … cleaning or dessert? Obviously, I made dessert first and continued cleaning while it was in the refrigerator! Place bowl and beaters for whipped cream in refrigerator. Heat oven to 350°F. Spray or grease 9″ round tart pan (with removable bottom) and place on a baking sheet. 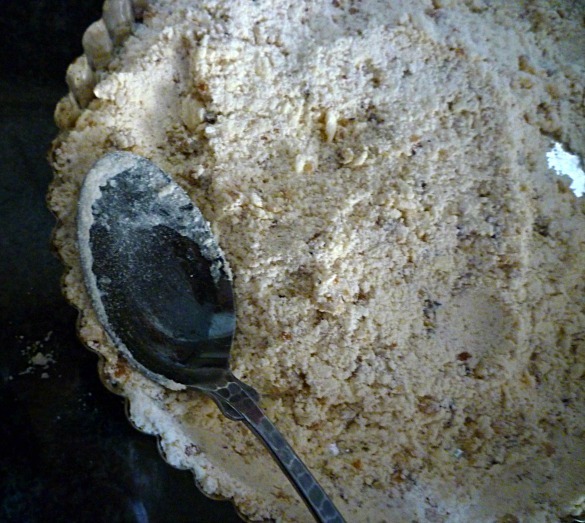 Make the crust – Mix flour, butter and walnuts together. Press into prepared pan (sides and bottom). Bake for 18 minutes. Let cool completely. Remove bowl and beaters from the fridge – Whip cream and 1 tablespoon powdered sugar until stiff peaks form. Place in fridge. In a medium bowl, mix cream cheese and powdered sugar until smooth. Add 1/2 of the whipped cream and whip until smooth. Spread on crust. 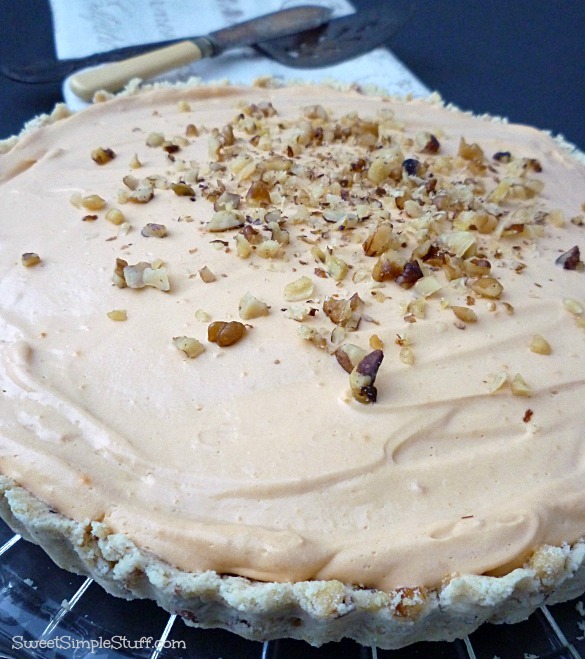 Use the same medium bowl, combine pudding mix and milk until smooth and slightly thickened. Stir in remaining whipped cream until combined. Spread over cream cheese mixture. Sprinkle with walnuts. Leave tart pan on baking sheet and chill for several hours. Remove tart from pan, slide on to flat plate, cut and serve. Serves 6-8. 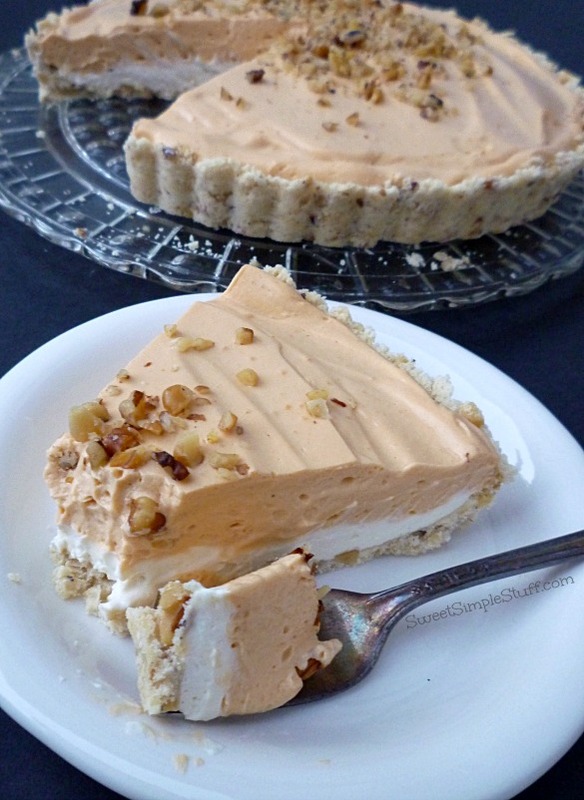 Handy dandy hints: Substitute 4 ounces of Cool Whip in place of the whipping cream. 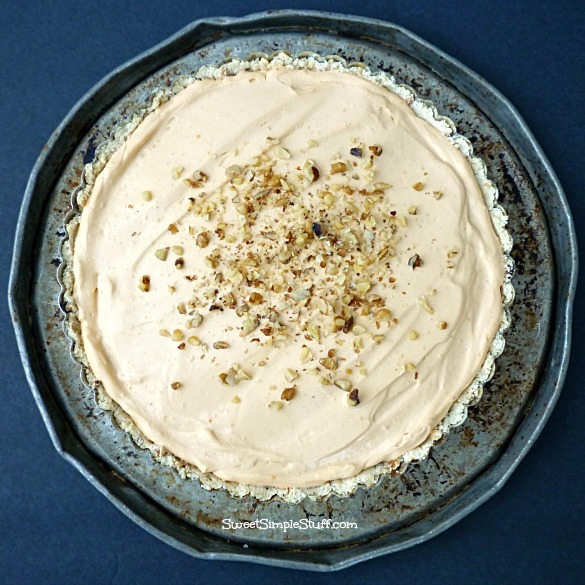 Use an 8″ square pan in place of the 9″ round tart pan. I put my tart pan on a baking sheet, so that I don’t accidentally push up on the removable bottom (before serving time). 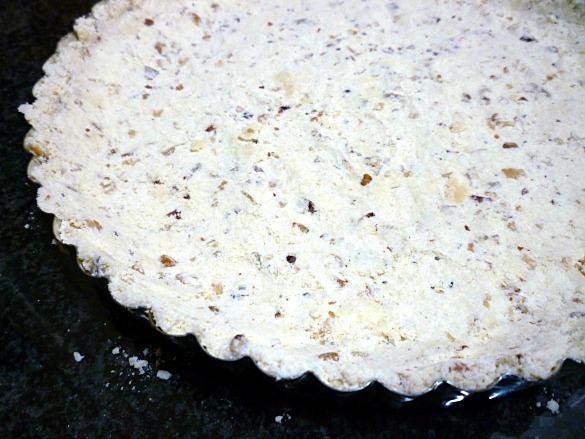 Use the back of a spoon to press the crust on to the sides of the tart pan. Even though I’m cleaning out … this pizza pan will be kept. It’s so handy and looks so ugly! I have had it since 1970-something. I don’t make pizza on this pan … the boys used it for frozen pizza, but it became known as the Tater Tot Pan. If I asked anyone in my house to get out the Tater Tot Pan, they knew what I was talking about! Confession … we are a Tot lovin’ family! I knew that if I covered this pan with Tots, it would feed three large hungry teenage boys and two parents. The pan doesn’t get used like it did in the past, but it does get used … sometimes to hold tarts!